We personally selected 15 of the most comfortable twin beds available, to make sleeping at Forest Haven Retreat a comfortable, rejuvenating experience. Together, the pillow-top mattress, 400 thread-count sheets and a cozy comforter ensure a good night’s rest. That is if you don’t stay up all night crafting! 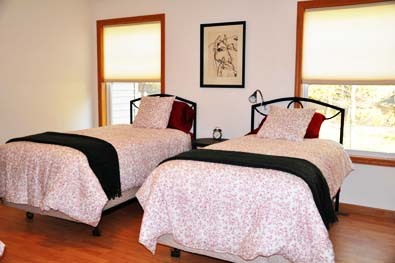 Bedroom #1 – Three individual twin size beds with an attached bathroom.